Chanteclaire Farm is no stranger to animals- after all, we were a working farm until the 1970s. Many of our couples choose to include their pups in their big day. We understand the desire to have your fur babies be part of your festivities. Weddings are all about celebrating with your nearest and dearest, and pets are part of our families. We welcome your four-legged best friends to take part in your Chanteclaire wedding. Here are some practical considerations to keep in mind when planning to include your furry friends. While each of our pups is perfect in our own eyes, be honest with yourself about your dog's personality. Some dogs are fine with crowds and noise, while others may be intimidated by the hustle and bustle of a wedding day. Make sure that you've seen how your pup reacts in a crowded, loud environment to test their readiness. If Fido barks and jumps, you may want to consider pet training, or including them in a more quiet environment, such as pre-ceremony photography. No matter how well trained your dog is, this will probably be his first time making a trip down a wedding aisle. Be sure to start practicing with your pup well in advance of the big day to make sure he is comfortable with his duties. Make sure your pet is present at your wedding rehearsal, along with his day-of handler, so both can be confident in their tasks. Please check with guests about any potential dog allergies prior to the big day. Nothing can spoil the flow of a well-timed affair like a trip to the emergency room. Most guests are delighted to celebrate with your pet, but it's best to make sure no serious problems will arise. Give your photographer a heads-up about your dog's involvement in your celebration, and make sure they are comfortable working with animals. Your photographer will want to discuss which aspects of the day your dog will be present: pre-ceremony, ceremony, formal shots, etc. You may want to give yourself extra time in your schedule to account for delays caused by Fido's unwillingness to pose for the camera...and for everyone to pet and cuddle. Your wedding day is always jam packed with things to do, but make sure you take some time to play with your pet. This has the benefit of letting your dog use her pent-up energy prior to her appearance, and helping you relax. If your dog is walking down the aisle, you will want to make sure a trusted friend is responsible for escorting them. You will also want to put someone in charge of making sure your dog is well taken care of throughout the day when you are preoccupied with wedding tasks. You spend a lot of timing choosing what options of food and beverages you're providing your guests, but don't forget about your pet's needs. We recommend having bowls of food and water available. The summer days can be pretty toasty at the farm, so be sure your pet is well hydrated. It's also a good idea to have some bags handy in case Fido leaves you an unexpected wedding present. If your dog just isn't ready for the ruckus that is a wedding day, you can still make his presence felt during your celebration. Consider having your pet take part in your engagement photos. A popular idea at the farm has been to give your dog a starring role on your wedding cake. Be creative, there are lots of ways to show guests that your dog is part of your family even if he can't attend. When Leigh bought Chanteclaire Farm in 2011, she took on the task of decorating the wedding cakes herself. The project is always a labor of love, with hours spent bending over each tier to create the couple's perfect vision. Leigh has studied boxes full of magazines and combed the recesses of Pinterest to make sure that her creations are modern and gorgeous. The results speak for themselves. Naked cakes are all the rage, and Chanteclaire creates some gorgeous examples. With cakes as moist and delicious as ours, your guests will never miss the extra icing. This design lets local produce take a staring role. Our couples are often drawn to Chanteclaire Farm for the natural beauty that surrounds us. 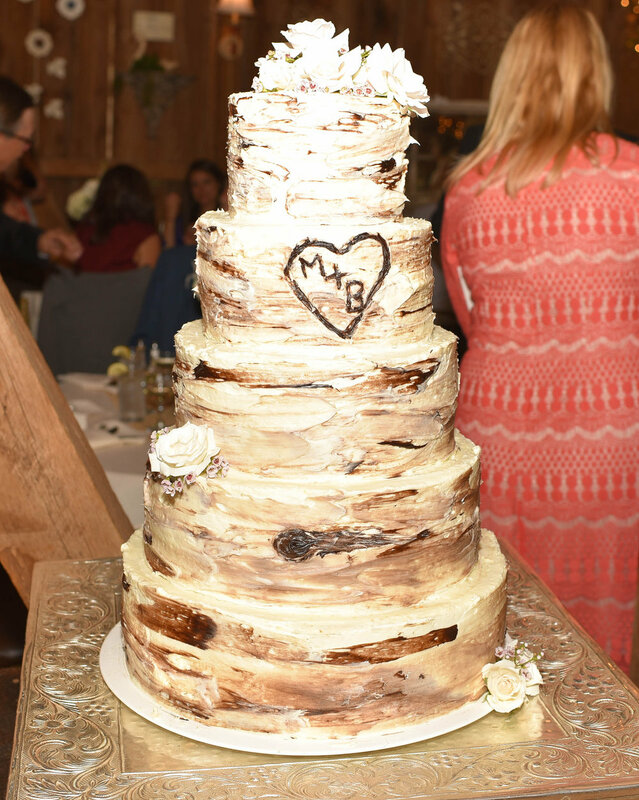 What better way to honor that love of nature than with a tree inspired wedding cake? Clean lines, unique shapes, and fun geometric patterns make for some stunning modern wedding cakes. Who says a country wedding can't sparkle and shine? From cupcakes, to pies, to a farm favorite- Swedish Princess Cakes, Chanteclaire has options for the couple who aren't interested in a traditional tiered wedding cake. Rustic cakes are some of our most popular. Burlap, twine, and delicate florals make a beautiful statement on your cake. Dreamy and feminine, with hints of floral, ruffles, and scallops, romantic wedding cakes are a beautiful finishing touch for your wedding meal. Everyone who loves Chanteclaire Farm also loves Beau, our vintage blue Ford truck. But recently we decided that Beau needed a classy little sister for our couples to enjoy. We are proud to introduce....Baby Blue! Baby is a gorgeous 1965 Triumph TR4, available for our couples starting in the 2016 wedding season. The Triumph was the epitome of the British sports car in the 1960s, driven by wealthy men wearing racing gloves, a blazer and a wool tweed cap. They raced through the countryside, and pulled magnificently up to their humble castles. Here is a cousin of Baby Blue's in a scene from The Avengers TV Series, 1961-1969Ep. 6.04. Chanteclaire Farm sprinkles this country chic ideal over the American countryside, so we think Baby Blue will fit in perfectly. Right now she is snuggled in a garage for the winter, but we can't wait to get the first shots of her with a Bride and Groom waving goodbye down the lane. Email leigh@chanteclairefarm.com if you'd like to learn more about featuring her at your event.